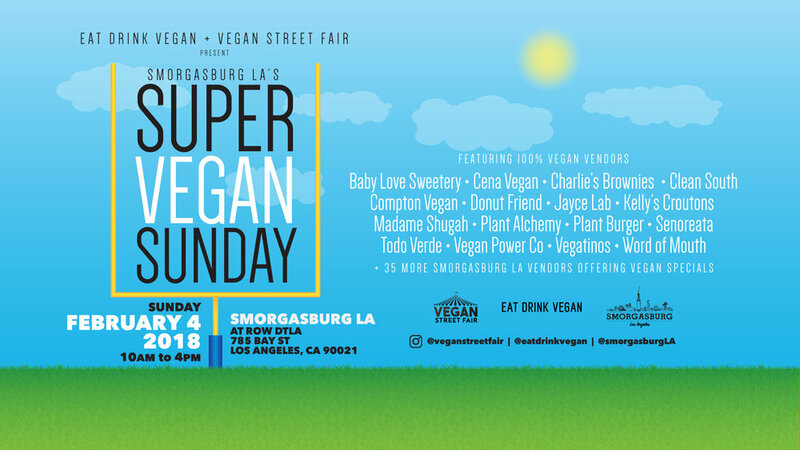 Smorgasburg LA is proud to team up with the Eat Drink Vegan and Vegan Street Fair to bring you our first annual Super Vegan Sunday on the day of the Big Game! Smorgasburg LA will transform into a vegan haven for the day, with all of our weekly vendors offering special vegan options, as well as select popup vegan vendors curated by Eat Drink Vegan and Vegan Street Fair. It will be the perfect place grab a bite and pick up vegan friendly party snacks to bring to the Big Game event, happening later that day! Not a vegan? Don't worry, we'll have you covered, too. Smorgasburg LA is always the perfect place for anyone to grab a bite, and Super Vegan Sunday will be no exception. Find whatever it is you want, vegan or not, all day long.